If you are an Outlook user who wants to sync your contacts, tasks and calendars with your iOS devices using iCloud, you may have been frustrated with some of its… um, deficiencies. 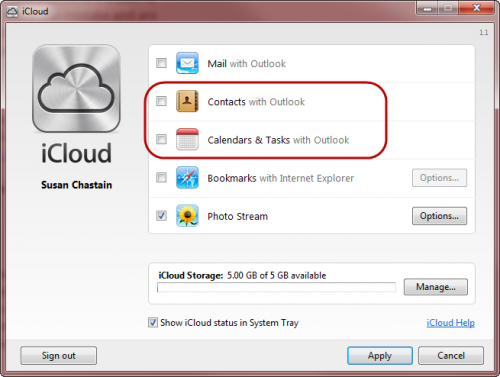 The primary issue is that iCloud moves all your contacts and calendar data into a special iCloud data folder which is not fully compatible with Outlook, resulting in a slew of difficulties. The main problem, for me, was that any new appointments or contacts I would create did not get saved to the iCloud folder by default, so it was always an extra step to move them after creating them. And if I forgot, they didn’t get transferred to my iOS devices. I also had problems with appointments, birthdays, and holidays randomly moving to different days–sometimes months from the actual date. I couldn’t trust anything on my calendar! And if I attached a reminder to an appointment, I would always get a warning about it not being supported for the folder, even though the reminder still worked–mostly. When using Outlook on the desktop, snoozing reminders saved in iCloud never worked properly. Another issue is that iCloud appointments were always set to a status of “busy” and then I would get warnings about schedule conflicts when there really weren’t any. I, personally, never experienced any issues with contacts syncing through iCloud as long as I remembered to copy them to the iCloud data folder, but I know people who did have problems such as duplicate contacts and so on. I put up with the aggravation of iCloud syncing for a year (with no improvements or bug fixes from Apple) because I hated dealing with iTunes syncing even more, and I didn’t want to have to remember to sync via iTunes daily to keep my contacts and calendar updated. 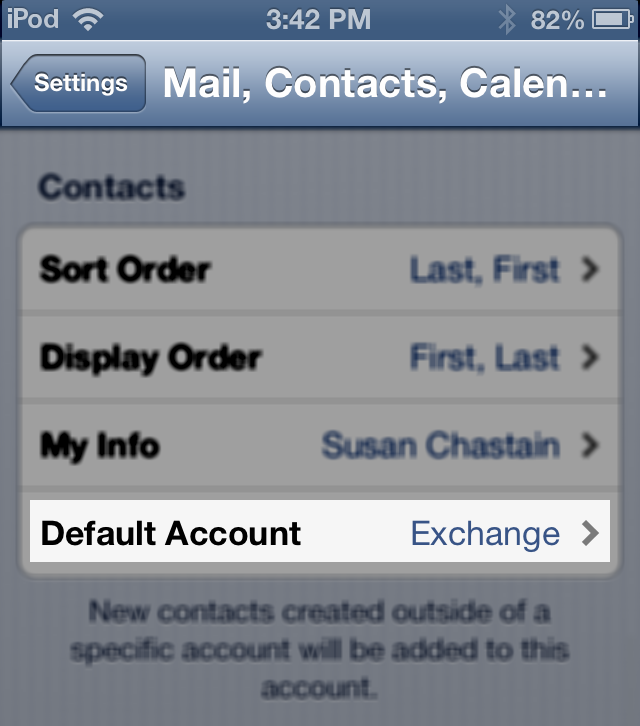 But recently, I learned you can sync your iOS devices with Microsoft Exchange. Actually, I knew this all along, but I thought Microsoft Exchange Server was a business service and that regular people like me could not use it. As it turns out, if you have a Hotmail, Windows Live, or Outlook.com account, you can use Microsoft Exchange to sync your contacts and calendar (but not tasks) with iOS! This article will explain how I switched from using the troublesome iCloud to using Microsoft Exchange for syncing my Outlook contacts and calendar with my iOS devices. Open a Microsoft email account from Outlook.com. You can get an email address under [email protected], @live.com, or @hotmail.com. Once you are set up with a Windows Live email account, you will need to download and install the Microsoft Office Outlook Hotmail Connector which allows Outlook to access the account. After installing the Connector, you need to add the Windows Live Hotmail account to the desktop Outlook program. 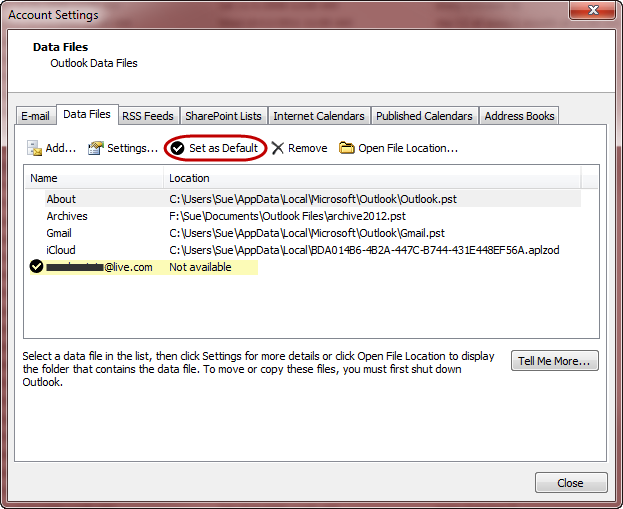 Once you do this, you will see a new data file in the left sidebar of Outlook with folders for each of your Windows Live email addresses as well as the other standard Outlook folders like Contacts, Calendars, Sent Items, etc. Your Windows Live account will have its own data file in Outlook. You’ll need to switch to the folders view in Outlook for this if you aren’t already there. Then you’ll need to move or copy all the items you want to sync from your iCloud data file to the corresponding folder for the Windows Live data file. If you weren’t using iCloud already, then just move the items from their current locations to the corresponding folders in the Windows Live data file. Note: Windows Live does not support sub-folders, so if you were using folders to create groups of contacts, you will not be able to keep them in separate folders if you move them to Windows Live. I don’t know of any workaround for this. If anyone does, please post a comment. Also, Windows Live does not sync tasks. If you need to sync tasks, you will need to create them as calendar events instead. Or, read the comments section after this article for some additional workaround suggestions. If you already had a Windows Live account with data in these folders, you may need to do some clean-up after you move the iCloud data in. Outlook should handle duplicate contacts when you copy them, but you will have to look over your appointments to check for duplicates. For appointments, you’ll want to switch to list view and sort by name without grouping to make duplicates easy to spot. See how to remove duplicate imported items in Outlook if you need help. I’d also suggest checking all your recurring appointments to ensure they have a correct recurrence pattern. You also might want to check the free/busy status for your appointments. I edited all of mine just to ensure I’d have no further issues like I was having with moving appointments. If you look at the screen shot below, you can tell which items came from the iCloud folder because the recurrence pattern will be in all caps. Once you edit them in Outlook, you will see the recurrence pattern in plain English and not all caps. Fortunately I had missed editing a few so I could show you this screen shot! As you scan the recurrence patterns for your appointments, you’ll notice the items from iCloud will be written in all caps. Assign your contacts from Windows Live to the Outlook Address Book. To make desktop Outlook save new contacts and appointments to your Windows Live account, you will need to change the default data file. But before you do this, you will want to make a backup copy of your Email Rules, because you’ll lose them when you switch default data files. Go to an email folder in the left sidebar. Choose Rules > Manage Rules & Alerts from the Home tab of the ribbon menu. Click Options, then “Export Rules.” Name the file and choose where to save it. Remember where you saved it so you can import it after changing the data file. 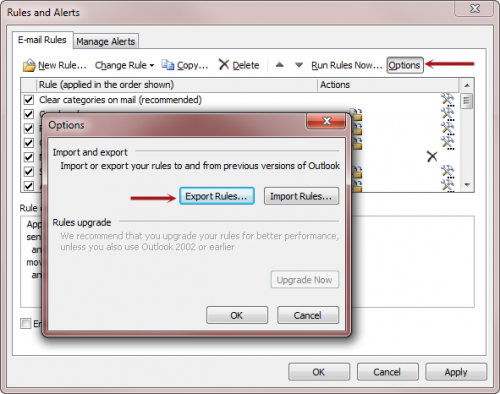 Export your rules in Outlook before changing the default data file for new contacts, appointments, and tasks. Select the File tab of the ribbon menu. Click Account Settings > Account Settings to open the Account Settings box. Click the Data Files tab. You’ll see a list of all your data files here along with the path to where the actual file is saved on your computer’s file system. Since the Microsoft Live data is stored online it will show “Not Available” for the location. Close the Account Settings screen. Go back to the “Manage Rules and Alerts” screen, and import the email rules that you just exported. Change your default data file in Outlook to your Windows Live account. Now, you may be wondering why you couldn’t have set iCloud as the default data file before, when you were using iCloud to sync. Let me save you some trouble–if you do that, Outlook will refuse to open. If you already made this mistake and are stuck with Outlook not opening, you can fix it outside of Outlook by going to Control Panel > Mail > Data Files. Then change the default data file back to something other than iCloud. In the Add Account screen of iOS, add a Microsoft Hotmail account to sync with Windows Live. Whether you set up your account as Hotmail, Windows Live, or Outlook.com, it’s all the same. 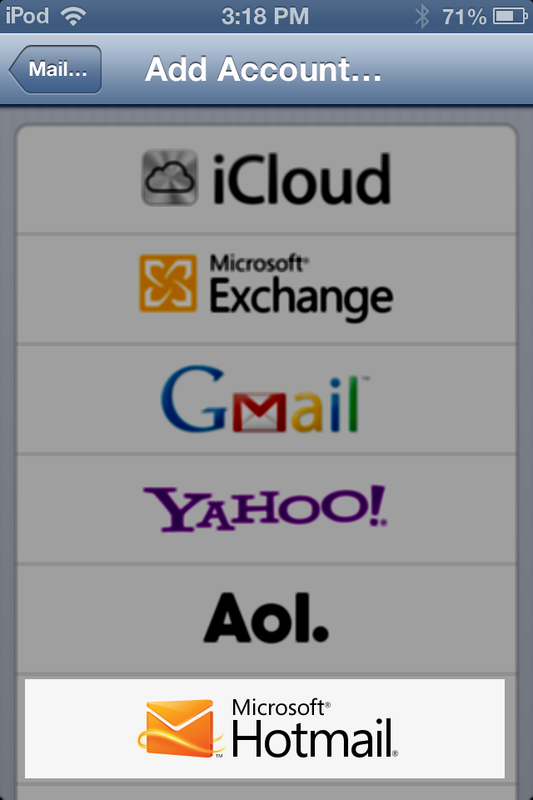 In iOS, you set it up as a Microsoft Hotmail account, no matter which extension you have for your email address. 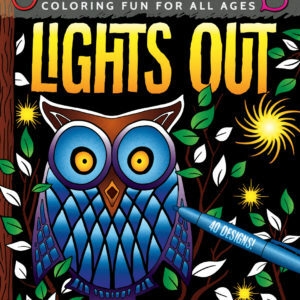 Apple has an article that describes how to do this: iOS: Hotmail, Live, or MSN email accounts. After setting it up, Apple refers to it as an Exchange account throughout iOS. 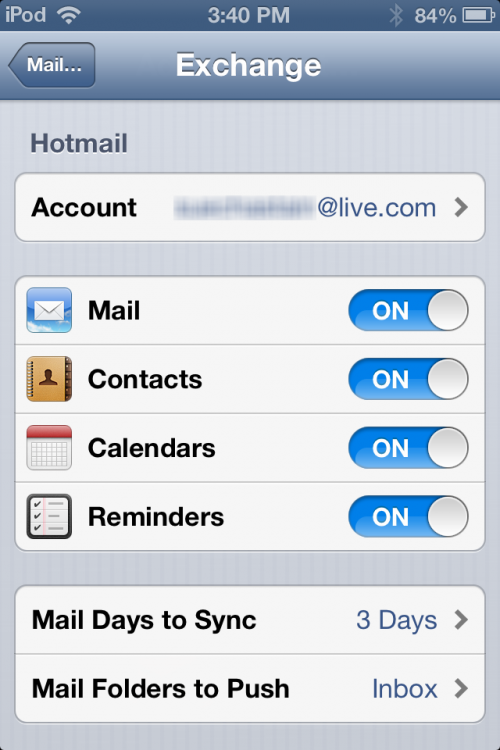 Once it’s set up, you can choose to sync one or all of the following: Mail, Contacts, Calendars, Reminders. (Although Reminders is shown as a sync option, it doesn’t actually sync with Tasks. This is a limitation of Windows Live.) Just turn on whatever you want to sync. Choose what to sync from your Windows Live account. You also want to set Exchange to be the default account for new items you create on your device(s). Repeat this for all the iOS devices you want to sync with your Windows Live data. The Microsoft Outlook Hotmail Connector will sync desktop Outlook with Windows Live, and your iOS devices will now also sync with Windows Live, so everything is kept in sync between desktop Outlook, Outlook.com on the web, and all your iOS devices. Go back to Outlook on your desktop computer, and do Send/Receive. It might take a long time to finish the first time after you’ve added all your contacts and appointments. A few minutes after it completes processing in Outlook, you should see all the information start to appear in the respective apps on your iOS devices. In your Contacts and Calendar apps on iOS, you can go to groups and choose which data sources you want it to show. 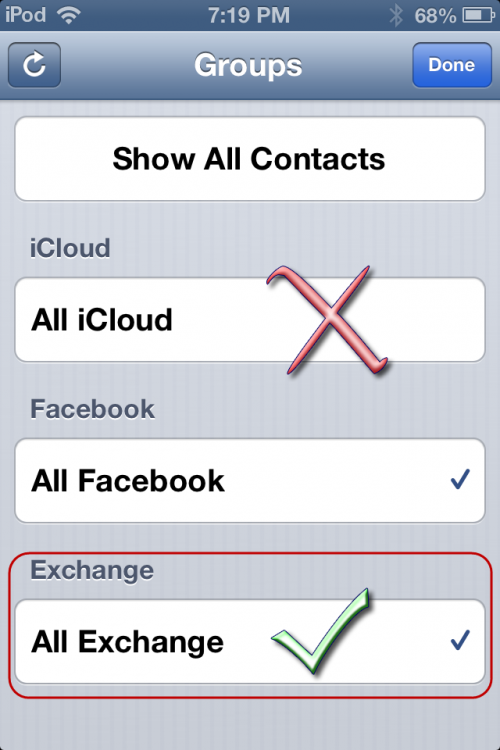 You will have groups for iCloud, Exchange, and possibly others, like Facebook. Since our goal is to do away with iCloud, you probably want to deselect that and only show information from Exchange. Deselect iCloud and select Exchange for the groups you want to show in your iOS apps for Contacts, Calendar, and Reminders. You may want to do some tests, creating and editing dummy data in both Outlook and on your device(s) and checking that everything is syncing as you’d expect. Once you are satisfied that everything is syncing, you can open the iCloud Control Panel on your computer and uncheck the boxes to sync contacts and calendars. When you apply the changes, it will probably ask you to shut down and re-open Outlook. Go ahead and do that. If asked to keep the information on your PC, I think it’s best to leave it. I’d rather have duplicates than lose data. If you were already syncing your iOS devices with Outlook through iTunes instead of iCloud, you may want to disable that, too, so all your syncing will be over the air with Windows Live. Finally, you have to go into the iCloud account under Settings > Mail, Contacts, Calendars on each of your iOS devices, and disable those items from syncing. Again, you will be asked to keep the data on the device or not. I chose to keep it, leaving it deselected in each app, knowing it will become outdated after some time. If you want to delete it later, you must do so through the iCloud.com web site. Don’t forget to also disable iCloud syncing on each of your devices. That’s it. Now you can enjoy a more seamless sync experience between Outlook and your iOS devices. It seems like a lot of steps, but unless you have a big mess of duplicates or corrupted data, it doesn’t take all that long to set up. When you installed Outlook Connector, did you leave Outlook open? I closed it to install OC, so when I re-opened desktop Outlook it did not prompt me for Windows Live account credentials. I’m sorry. I left a step out of the process. You need to add your Windows Live account as a new account in Outlook. I’ve edited the article. Thanks for bringing it to my attention. Thanks for the details on this. This is exactly what I have been looking for to sync. I have one question, I have been syncing my iphone to outlook through itunes. Do you think moving the folders in outlook as you described will end up duplicating everything on my iphone or will it know the appointments, etc were moved in outlook. Would I be better off wiping my phone clean before I do this? Thanks again. Hi Ralph. I’m not entirely sure since I haven’t synced through iTunes in a long time. I think it would put them in a separate group on the iPhone if it does duplicate them, but I can’t say for sure. The safest thing to do would be to make sure you have a backup of your contacts & calendar from Outlook (copy them to a new PST file, then close it). Then it would be safe to wipe them from your iPhone, copy them to Windows Live in Outlook and then begin syncing to iOS with Exchange. This worked out well, thanks. The first thing I did was turn off the sync in itunes. It asked me if I wanted to remove everything from my phone. I answered yes to clear the phone. That way it copied cleanly from the hotmail account. One additional question, it copied a lot of stuff from my desktop calendar but it did not copy everything. It seems if I go into a specific calendar event that didn’t copy and resave it, it copies it to the hotmail account at that point. Do you know of anyway to force everything to copy without me having to check which appointments didn’t copy to the hotmail account and then save them individually? I do have version 14 of hotmail connector installed. I’m glad to hear it worked for you, Ralph! Did you do a send and receive in Outlook on the Hotmail account? I think that should do it–it seemed to for me, anyway. The first send-receive after I copied everything took quite a while. If yours got interrupted, it might have missed items. You also might need to go into the “show calendars” screen on the iOS Calendar app, and press the circular arrow to force a sync on that end. Larry, you are right. Tasks don’t sync. On my system the tasks folder says “(This computer only)” next to it. Sorry I didn’t mention this in the article–I will go back and edit it. I personally prefer to just use tasks on my computer because the Reminders.app in iOS is so weak. If I need a task on my iDevice, I create it as an event instead. If you don’t want to do that, I guess the options would be to continue using iTunes or iCloud sync for tasks, or try to find a third-party app that syncs with Outlook tasks. Thanks Sue. If there is a good third party app that offers a good option for wireless sync, I haven’t found it and I have looked. I have found that Toodledo syncs my tasks and notes automatically between my iPhone and Ooutlook 2010 on my PC desktop (Windows 7). Thanks for letting us know, Malcolm. Perhaps this will be of use to Larry. After several months of having things set up this way, I have to mention a few more caveats. If you chose to leave your iCloud contacts and events on your device when you disables it and now want to delete those items, you will need to turn iCloud sync back on–only on the device–then choose merge when it asks you. Then turn it off and choose to delete the items when asked. 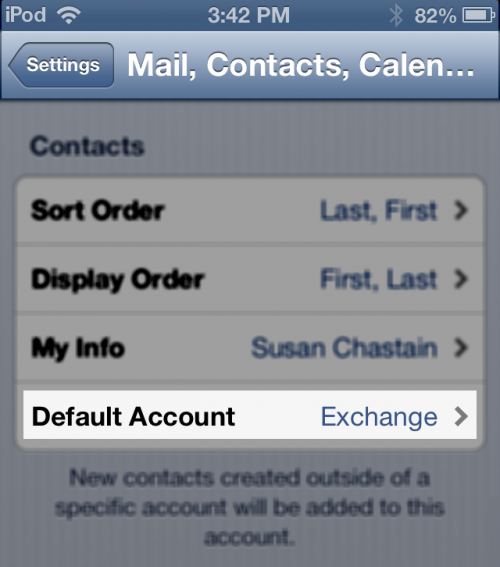 This will delete the static items left from iCloud, and leave the Exchange items alone. So now I have the arduous task of fixing all my contact birthdays in Outlook, and then I don’t know what I am going to do about syncing. Very frustrating! 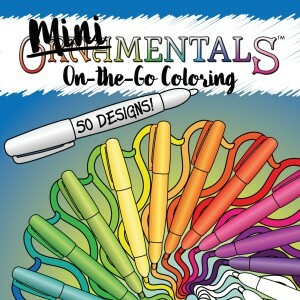 Thank you for this amazingly comprehensive and clear account of how to do this. I am (I think) delighted to have got rid of Icloud. A problem was that the process appeared to get rid of all my Notes and all my Tasks in Outlook as well as the Rules. The Rules I quickly recovered thanks to your warning. The Notes and Tasks were fairly easy to get back as I was backed up from the previous day, but I was not expecting them to depart. Perhaps I made an error? But I have two questions. Firstly, should I “expect send and receive” to continue to take much longer than before? It often seems to get stuck and I cancel. Then the Synch Log tells me there is an error on a particular email. I have been finding and deleting them – but having looked carefully at the time of the error and the time of the cancel and it seems to me that I have created the error myself by cancelling! 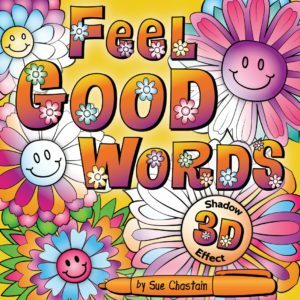 Is there a way of telling that all is well during a send and receive? And second, and more importantly, it was frustration at random deletions and numerous duplications in my contacts that finally drove me to seek an alternative to Icloud. My setup now does not look exactly as you describe and illustrate it in your wonderful instructions – I can’t see any way of getting rid of “All in Icloud” (called “All on my Ipad” in my set up) – anyway there are some contacts stuck in “All in Icloud” that I would dearly love to get over to my Outlook folders and I can’t see how to do it. I have now followed your instructions through to the end so I wonder if I need to go back over some bits? Sorry to be asking for further advice, you have taken me way ahead of my abilities! PS – As for the Birthdays, I have always just entered them in Outlook as separate recurring all day events, presumably this would be a crude but simple solution? Glad you found it useful. Notes and Tasks are not supported through Windows Live, unfortunately. Send and receive can take longer depending on how Microsoft’s servers are doing, but it’s usually not noticeably slow except for that first time when you are syncing everything. 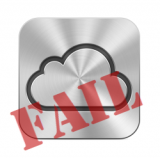 I described how to get rid of the iCloud items left on your device in the comment above yours. Basically, you have to turn it back on (in iOS), and then off, and it will ask you about deleting them from your device. If you don’t have all of those items in Outlook, you can either share them one at a time before deleting, or find an app that lets you email multiple contacts. You could also look for the “iCloud Archive” file in Outlook that is created when you disable iCloud on the PC. It should have everything in there. This may sound crazy, but I have actually gone back to iCloud since discovering the birthday bug mentioned in my comment above. Apple released iCloud version 2 not long after I did the switch to Exchange, and I thought I would give it it a try. They improved it a lot! So far (only 2 days) it is working pretty good. There is some minor wonkiness with Tasks, but nothing devastating. I want to run it this way for at least a few weeks to see what comes up and then I will post a write-up on it. If you subscribe to my newsletter or to the comments on this post, you should get a notification when that is published. I knew Notes and Tasks were not supported and was quite happy for them not to synch – but didn’t realise that meant they would vanish from my PST file! But as I say I have recovered them all from my backup. Sorry, of course you had already explained how to get rid of the items left on the device – I was trying to ask how on earth I get the ones that have mysteriously stuck on the Ipad over to Outlook, and you have now explained that. It was icloud 2 that finally made me abandon the system – the “Refresh iCloud” button vanished from Outlook and it stopped synching; it appears this is a commom problem with V2, I only got it back by reverting to the earlier version. There is no reason why you should coach me on my problems – just let me know if you’d rather I stop posting and look for advice elsewhere…but… Send and Receive is still hanging forever (as in all night) at 99%. If I cancel it I can then do a manual send and receive that works, but the next automatic one hangs. The Synchronisation Log just shows the same long routine repeating over and over again even when there are no reported errors. Contacts are still misbehaving, though it seems as if it is an ever changing and improving situation. Ones created on the Ipad now appear in outlook, but not the other way around. Appointments seem to be ok.
Julia – no problem. I will try to help with what I can. A lot of it is still a mystery! Notes I don’t use, and in my case, the tasks went into the Windows Live data file with “(this computer only)” after it. I don’t recall if I moved them there myself or not. I probably moved them myself because I didn’t realize at the time that Windows Live would not sync them. Yikes… sorry to hear about the button disappearing! I hope that doesn’t happen here but I will keep a look out for it. I wonder if the contacts not appearing has something to do with the send/receive errors you are seeing. If you can get to live.com or outlook.com you can check to see if they are showing up there. If they’re not there, then the problem is between Outlook and Windows Live. Hello again, things are looking up! All the synching problems have slowly resolved though I am not entirely sure why. I read somewhere that it didn;t like more than three levels of folders so I went through outlook and got my whole email folder system down to three levels. I also had my system set to send and receive automatically every 10 minutes and I wondered if the first huge send and receive was getting into a muddle because of this, so I set it to every 1 hour. It has stopped hanging now, though I have not yet set it back to every 10 minutes – but I have done several manual ones quite close together with no problem. I think I have now tested both contacts and appointments going from Ipad to Outlook, and from Outlook to Ipad and going to both if I enter them online. Whew. Now all I need to do is get the batch of contacts – quite big – which has remained on the ipad over to Outlook. Thanks so much for all your help. I am now subscribed! Great to hear. I’m crossing my fingers that it continues to work well for you. I gave this a try because I was fed up using iCloud to sync my contacts from Outlook to my iPhone, mainly because the iCloud folder can’t be set as the default one. So I tried this instead, but now I find that syncing of contact photos is not supported by the Outlook.com connector. Ughh! Isn’t there anything that just works properly? Now the iCloud folder can be the default. So far, iCloud 2 is working well for me. Thanks for the update, Sue. I was almost ready to give iCloud 2 a try until I read that you can’t send IMAP email, which is a show-stopper for me. I installed GSyncIt today (I had to pay $20 for it and I might need to cough up another $10 to get it working on a second PC) but it does seem to be doing a decent job of syncing Contacts and Calendars to my Gmail account (and from there I can sync my iPhones to Gmail for free). It’s not a perfect arrangement because I otherwise wouldn’t use Gmail at all, and I’m not crazy about having to pay a 3rd party for something that should just work, but it does seem to be a viable solution. Yeah, all this sync stuff is frustrating. I just got an Android tablet and am trying to decide if I want to even bother with syncing to it. 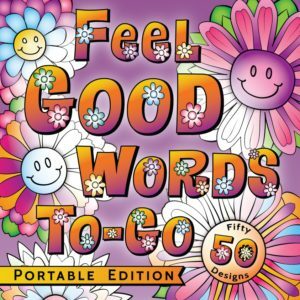 I probably won’t bother since I will mainly be using it for reading. Thanks for mentioning GSyncIt! I’m sure other folks who read this will appreciate having one more option to look into. Unfortunately, GSyncIt isn’t perfect either. 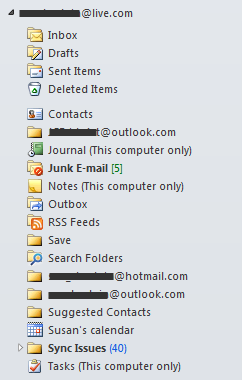 One thing I found it doesn’t do is synchronize Outlook categories. I use categories to keep track of who to send holiday cards to, and since it’s that time of year, it’s causing me a lot of grief that I’m losing Category information. I also find that the GSyncIt approach doesn’t like contacts without email addresses. I have a handful of these, and they seem to multiply as duplicates every time I sync. Arghh! Amazing that it’s 2012 and this simple problem hasn’t been properly solved seemingly by anyone! The problem with all of these is that each and every one promises that it will work, but all come up short in one way or another, and you don’t know what that will be until you spend an enormous amount of time trying it. If I have the time, I might. I’m just hoping that MS or Apple will get it right one of these days! Too many details, I don’t know why? In this article I found a very simple solution to get my contacts that i create on the device to sync with iCloud. This was the information i was looking for and i got it from this article. Only one change i made in the device setting in the Contacts section was that I chose the Default Account to iCloud which before was set to Gmail Contacts. 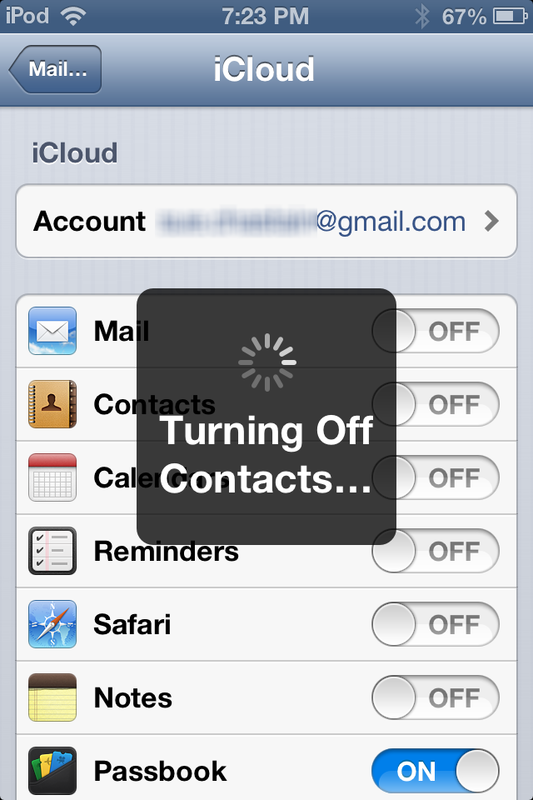 So when i would create a contact on the device it would sync with my gmail contacts but not with iCloud contact. I had chosen Gmail Acount as Default account for Contacts unknowingly or it was from the time when i transferred all my contacts to my device from Gmail. Thanks for this overview! I’m running into problems with your step “Move the Items You Want to Sync from the iCloud Data File to the new Microsoft Data File” and wondered if you might be able to help. I want to put my Outlook Calendar (the default one that appointment requests are accepted to) in the Hotmail folder so that it syncs with my iphone. But when I try to move the Outlook Calendar, I get an error “cannot move the items. Special and default folders, including Inbox..Calendar…,cannot be moved.” I was able to copy the Outlook Calendar and put that copy in the Hotmail folder and see the calendar entries on ios, however that solution would not work long-term as I would have to make a copy and paste it into the Hotmail folder every time I made a new calendar entry. I’m trying to make my life easier…. Any insight into this issue? Mishy: Outlook will not let you move the entire Calendar folder–you have to move the items inside it. Switch to list view, then select all, and move or copy them. Hope that helps. Also, you might want to read my follow-up article linked from the end of this post. 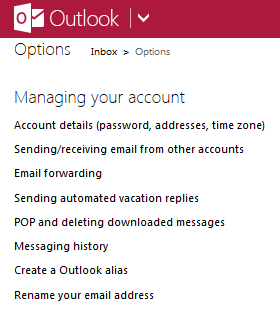 I am probably missing the simplest part of all, but how do we get the data in Outlook Main PST file to Hotmail/Live/MSN? Assume we have both set up in Outlook. 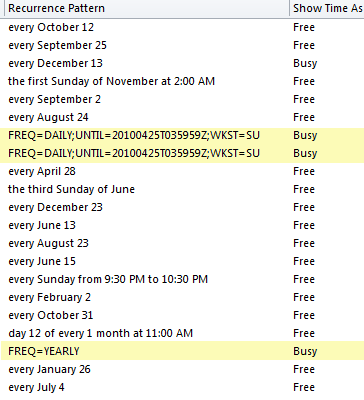 Can we simply highlight and delete all in the contacts list and than in the calendar list in Hotmail/Live/MSN? Than do a copy command from Outlook Main PST? If I use the move command I do get all my contacts in the Live/Hotmail/MSN account but don’t have anything left in Outlook PST. Hi Sue – just came across this article which is a great overview of how to get away from iCloud issues….. you _may_ want to put your change of heart at the top of the page though as I’d gone through all this and done the change then saw your comments on iCloud 2.0!!! BIG Grin!!! Anyway, I’m going to persevere with the Outlook.com plan for a bit to see if it works and I’m _even_ considering going back to a Blackberry as at least there aren’t these sorts of issues!! So, my question for you now is – how do I stop the outlook calendar appointments being sent from [email protected]? I’ve got a business email account – not exchange, hence the workarounds I’m looking for – and it just doesn’t seem professional to be coming from an outlook.com account. Any thoughts on this please? Many thanks for your help with this. All the best from Sydney Australia. I can’t imagine a more USELESS premise from which to develop a software package or data share platform. I’m one step closer away from making the switch to LG.